The library generates SVG as defined by the Scalable Vector Graphics 1.1 Specification (http://www.w3.org/TR/SVG11/). Output goes to the specified io.Writer. a minimal program, to generate SVG to standard output. You may view the SVG output with a browser that supports SVG (tested on Chrome, Opera, Firefox and Safari), or any other SVG user-agent such as Batik Squiggle. 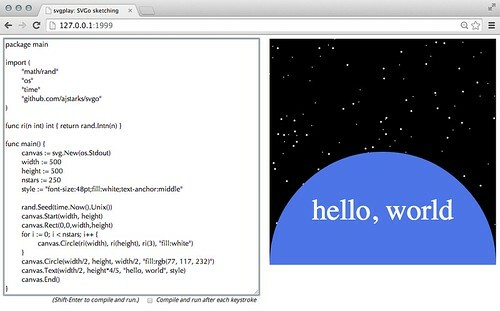 Combined with the svgplay command, SVGo can be used to "sketch" with code in a browser. Next open your browser to the svgplay server you just started. on the right. To update, change the code and repeat. Note that compilation errors are shown in red under the code. In order for svgplay/SVGo to work, make sure that the io.Writer specified with the New function is os.Stdout. Many functions use x, y to specify an object's location, and w, h to specify the object's width and height. Where applicable, a final optional argument specifies the style to be applied to the object. Most operations are methods on this type, specifying the destination io.Writer. Constructor, Specify the output destination. begin the SVG document with the width w, height h, with a viewBox at minx, miny, vw, vh. begin the SVG document with the width w, height h, in the specified unit, with a viewBox at minx, miny, vw, vh. if the first variadic argument is a link, use only the link reference. Otherwise, treat variadic arguments as the text of the script (marked up as CDATA). if no data is specified, simply close the script element. Style defines a script with a specified type, (for example "text/css"). if no data is specified, simply close the style element. begin a group, with the specified style. begin a group, with the specified id. begin a group, with the specified transform, end with Gend(). begins coordinate translation to (x,y), end with Gend(). scales the coordinate system by n, end with Gend(). scales the coordinate system by x, y. End with Gend(). SkewX skews the x coordinate system by angle a, end with Gend(). 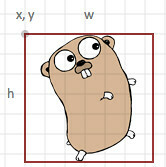 SkewY skews the y coordinate system by angle a, end with Gend(). SkewXY skews x and y coordinate systems by ax, ay respectively, end with Gend(). rotates the coordinate system by r degrees, end with Gend(). translates the coordinate system to (x,y), then rotates to r degrees, end with Gend(). rotates the coordinate system r degrees, then translates to (x,y), end with Gend(). end the group (must be paired with Gstyle, Gtransform, Gid). creates a mask with a specified id, dimension, and optional style. attribute to be either userSpaceOnUse or objectBoundingBox. specify the text of the description. specify the text of the title. begin a link named "href", with the specified title. place the object referenced at link at the location x, y.
draw a circle, centered at x,y with radius r.
draw an ellipse, centered at x,y with radii w, and h.
draw a series of line segments using an array of x, y coordinates. draw a rectangle with upper left-hand corner at x,y, with width w, and height h.
draw a rectangle with its center at x,y, with width w, and height h.
is specified by rx (width), and ry (height). 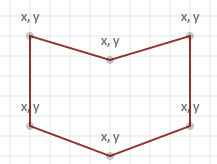 draw a square with upper left corner at x,y with sides of length s.
if false, the arc is drawn counterclockwise. otherwise the arc sweep is less than 180 degrees. with control points at cx,cy and px,py. 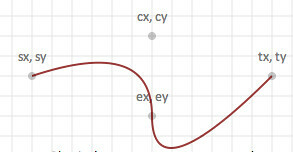 with control points are at cx,cy, ex,ey. with the control point at cx, cy. draw a line segment between x1,y1 and x2,y2. draw a polygon using coordinates specified in x,y arrays. place at x,y (upper left hand corner), the image with width w, and height h, referenced at link. Place the specified text, t at x,y according to the style specified in s.
Places lines of text in s, starting at x,y, at the specified size, fill, and alignment, and spacing. places optionally styled text along a previously defined path. by the (r)ed, g(reen), (b)lue components. between 0.0 (fully transparent) and 1.0 (opaque). 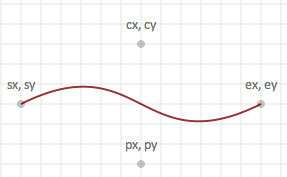 along the vector defined by (x1,y1), and (x2,y2). The stop color sequence defined in sc. Coordinates are expressed as percentages. centered at (cx,cy), with a radius of r.
(fx, fy) define the location of the focal point of the light source. The stop color sequence defined in sc. Coordinates are expressed as percentages. draws a grid of straight lines starting at x,y, with a width w, and height h, and a size of n.